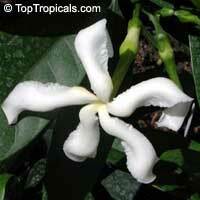 Samoan Gardenia - very rare plant. Intoxicating sweet fragrant blossoms - a pinwheeled shaped work of art. Very slow growing. This species was previously misnamed as Tabernaemontana holstii, which according to the recent taxonomy is a synonym of a different plant, T. pachysiphon. 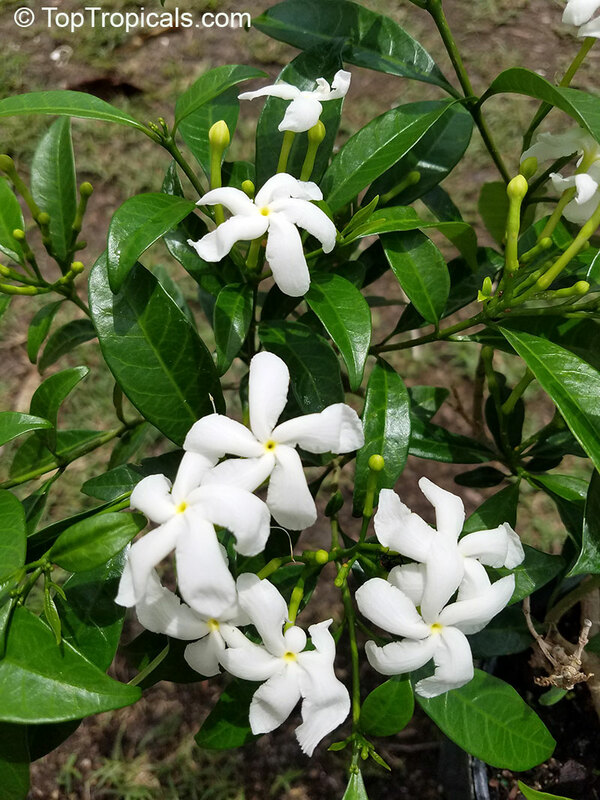 With its fragrant white flowers of a beautiful shape and very dark green waxy leaves, elongated and pointed, this plant is an amazing addition to a rare fragrant plant collection. Slow growing, and low growing bush which makes it very valuable for landscape understory. It can be trimmed and maintained in small size 3-4 ft; however if you let it go it will grow into very attractive, dense and bushy specimen up to 5-6 ft tall. Great specimen, accent plant, and container plant. 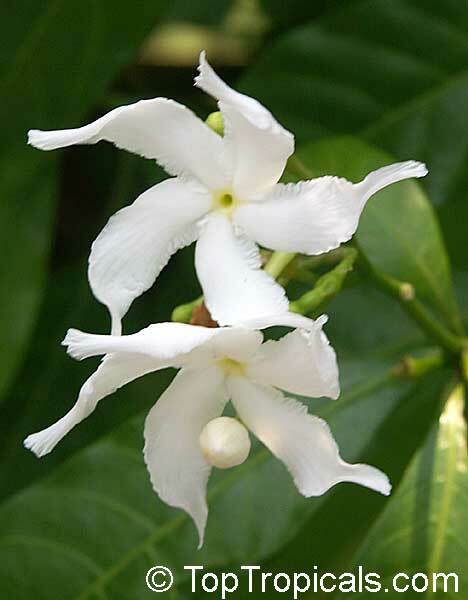 This rare species of Tabernaemontana is often confused with T. divaricata (commonly known as Pinwheel Jasmine) and T. orientalis (Banana Bush). However this Australian relative of Pinwheen Jasmine plant has its own distinctive features, and flowers look more like T. africana, although smaller size (1" in diameter). Adams Apple. 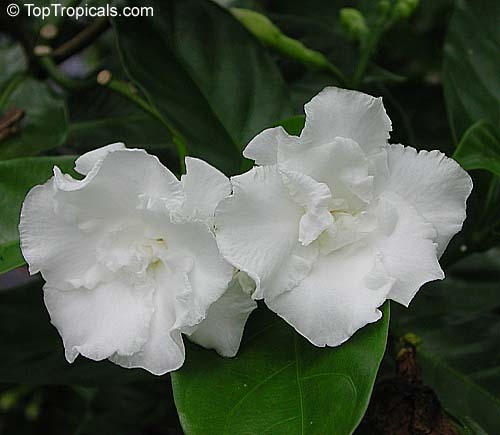 Tabernaemontana crassa occurs in humid tropical Africa. 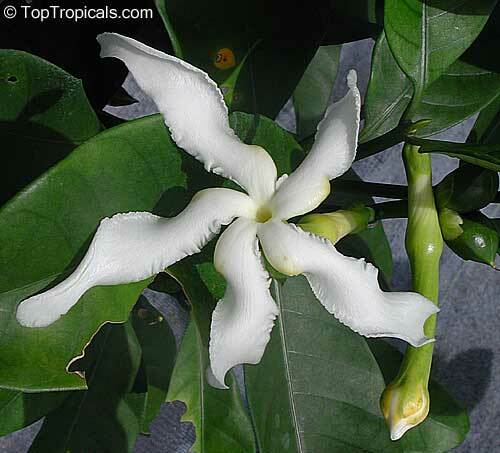 It has large waxy leaves and pinwheel-shaped large fragrant flowers. The plant contains a large number of indole alkaloids with interesting pharmacological activities. 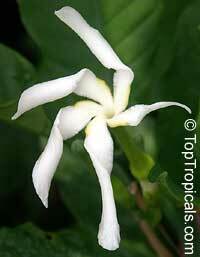 The alkaloid content is similar to that of Tabernaemontana pachysiphon, another medicinally important species. Traded internationally in herbal medicine shops. 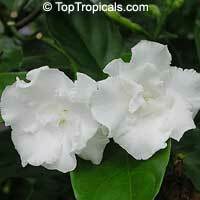 Crape Jasmine, Carnation of India, Florida Gardenia - fast growing bush with waxy leaves and beautiful fragrant flowers. Banana bush, rare variety. Jasmine-like white pin-wheeled fragrant flowers with yellow center, 5 petals with long tips fusing to form tube, regularly symmetrical. The flowers are then followed by a pair of seeds that look like two bananas hanging in opposite directions, hence its common name. They start out red and then turn yellow when they ripen. 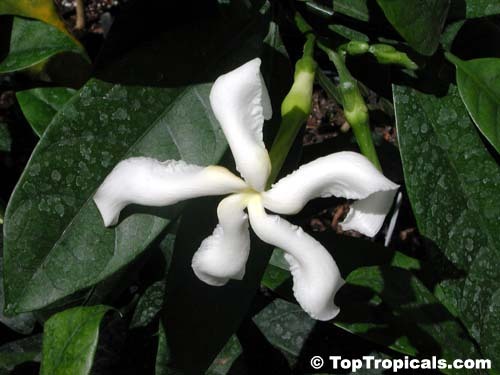 In some sources Tabernaemontana pandacaqui is indicated as synonim of Tabernaemontana orientalis however in our opinion they are different, with T. orientalis having pointed petals and T. pandacaqui rounded ones. 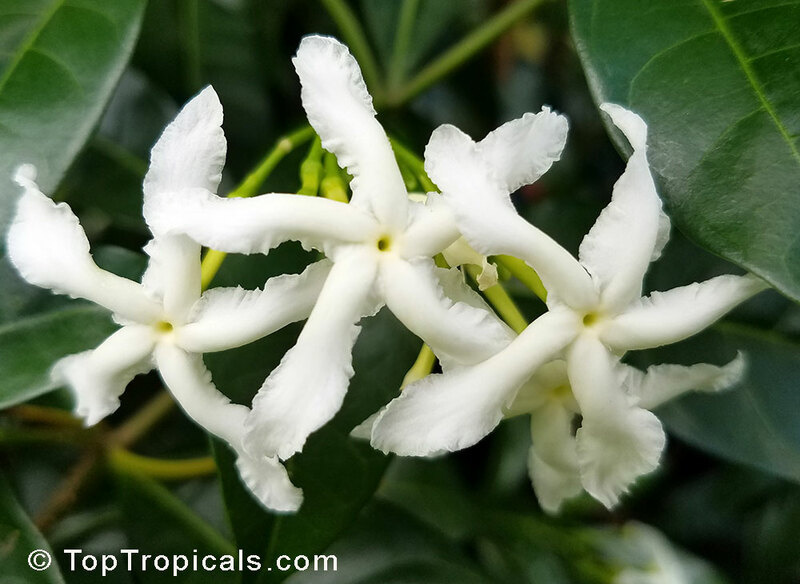 Very cute low growing shrub native of the South Pacific, with Jasmine-like white pin-wheeled fragrant flowers, 5 petals with long tips fusing to form tube, regularly symmetrical. It is a perennial shrub that grows only 3-4 ft tall. Its lush green foliage is a great backdrop for the abundant and continuous small white flowers that are pinwheel shaped. The flowers are then followed by a pair of seeds that look like two bananas hanging in opposite directions, hence its common name. They start out red and then turn yellow when they ripen. 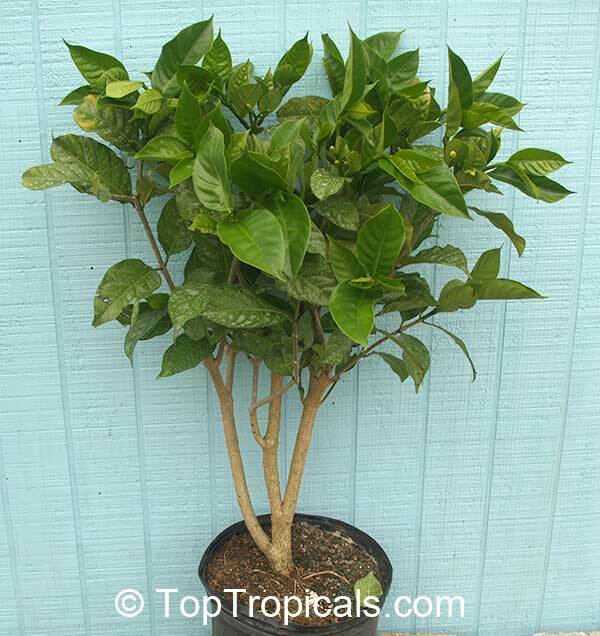 Banana Bush works well as a mass planting, specimen shrub, or containerized accent piece. It is also drought tolerant once established and is a moderate grower. Ectra benefit is lack of pest problems associated with it. This plant is truly a winner. Uchu sanango. 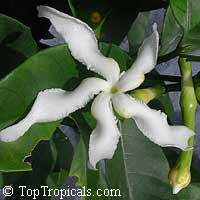 Rare tropical species with large leaves, fragrant flowers and edible fruit, used in S. American folk medicine. The leaves are the largest of all tabernaemontanas and can reach 12" in length and 5" in width. Very tropical looking. plant. 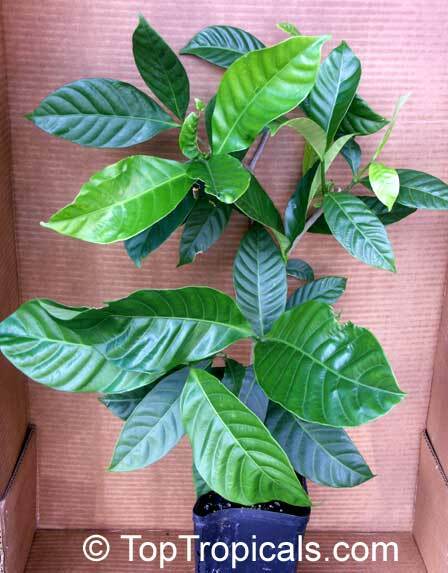 See picture of the plant in 2 gal pot. Variegated tabernaemontana Golden Rain. 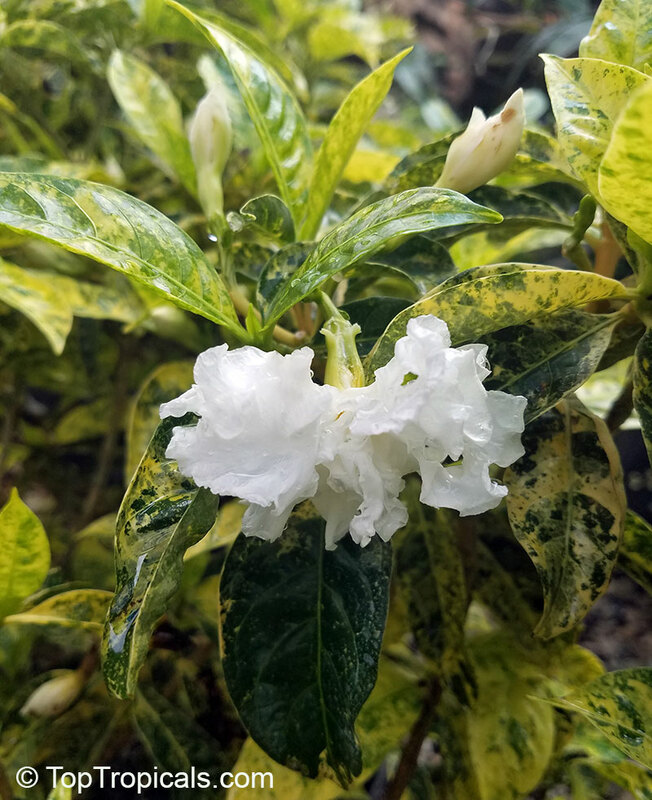 Small compact bushy shrub, looks similar to tabernaemontana divaricata Flore Pleno (same growth habit), but foliage is variegated. Flowers are fragrant. Nice specimen plant, very hard to find.